But, do you (personally) let excuses impede your fitness progress? That's really a trick question. If we are all brutally honest with ourselves we know that excuses are inevitable and using them is going to happen. The trick however, is to not let the excuses to continue to hold us back. I've had the privilege to work with thousands of clients over the past 25 years and have heard every excuse on the planet on why people are not making progress. I honestly should've written a book about them all. Today I wanted to talk about the 5 most common excuses we all use and give some tips to OVERCOMING THEM. First off, when you say you don’t have enough time, what you’re really saying is “I don’t have enough time for that”. I love the caption in the photo above. I think if you truly looked at your day you could carve out at least 15 to 20 minutes. Do you really think that if you were to add up all the time you spend watching TV and surfing the web throughout the average week you couldn’t replace any of it with a workout? A 30-minute workout takes up only 2% of your day. One thing that will help you make time is to change your mindset. Don’t ask yourself how much time you’re going to waste by working out a few times a week. Ask yourself how much of your life you’re going to waste being unfit and overweight. Instead of trying to find time to work out, think about how you can make time. Some activity is better than none. The trick is to find a block of time in your daily schedule that’s consistently free of commitments. Try to make time before and/ or after shifts, during your lunch hour, or after dropping the kids off at school. The time commitment can be minimal. Start with 10-minutes in your day. The next week, go for 11-minutes and the following week, 12-minutes. Soon that found time will become part of your schedule. Walk every time you are on the phone so that you can knock out some more steps. Try to add some simple stretches and mobility work first thing in the morning. The point is to make some time to fit in (no pun intended) healthy activity. EXCUSE #2: I need to be motivated to exercise. 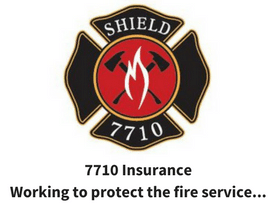 Heart attacks, stroke and cancers are the leading killer of firefighters, EMTs and medics. Following a regular exercise and nutrition program can significantly reduce your risks of these health issues! If that is not motivating for you, look around you. Your family, your crew and your community are also depending on you and your physical ability to help them. For me, I never want to tell my crew that my fitness let them down. That thought motivates me to get to the gym. If you think you need motivation to train you’re already half beat. What you really need is "meta" motivation: the motivation to train even when you’re not motivated. If you rely on your feelings to decide whether to workout or not, you never will. The basic idea is that procrastinators (which we all can be) often put off doing certain things because the size of the task in front of them seems too overwhelming. You then start to "dread" the workout and talk yourself out of it. By deciding to just go to the gym for a ‘few minutes’ you’ll often see the workout through to completion. So, instead of thinking about the entire workout, just think about doing 5-minutes of stretching and see where it goes from there. That’s all you need. If science doesn't work to motivate you, here are some other suggestions to get you moving. 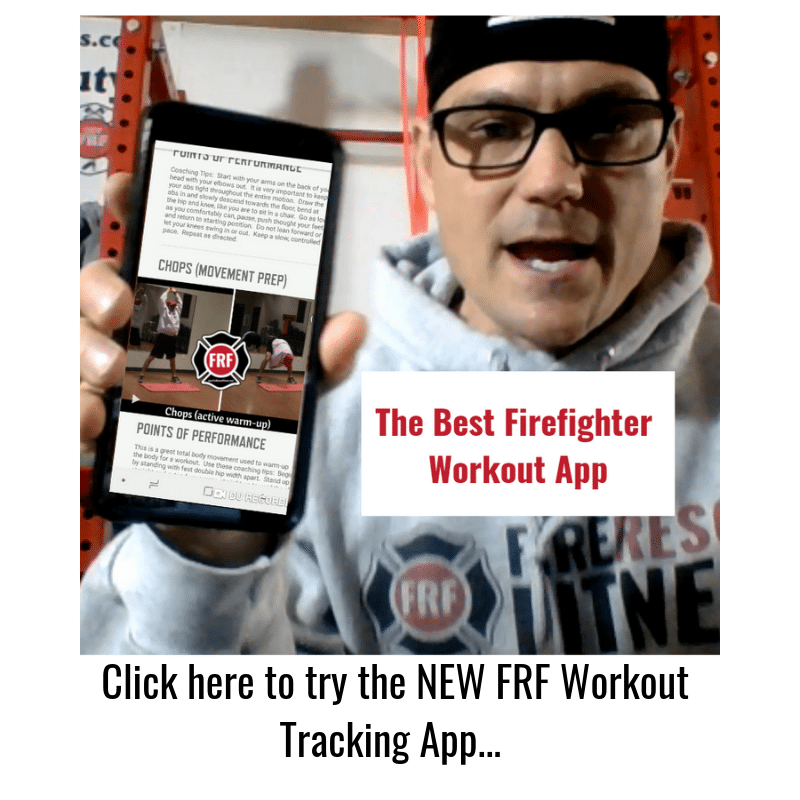 Make a chart or keep a log (Google “Exercise Chart” for examples) or track your workouts using a tracking app like the FRF TrainHeroic App. Give yourself a reward for meeting your fitness goals – a reward that you really want. If you love massages, book a massage at the end of every month you complete your target number of work outs. Join the FRF Fit for Duty Challenge (click here). You can win cash, swag and prizes for accomplishing your workouts. Thousands of fire rescue athletes have joined. Click HERE for more information. Excuse #3. I don’t know how to train properly. If you’re reading this article, you’re in the right place. 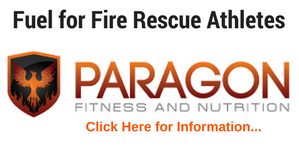 I post regularly on the Fire Rescue Fitness blog with exercise and workout tips and tricks. This site alone will give you more than you need. My goal with Fire Rescue Fitness is to help 100,000 firefighters, EMTs and medics get fit for duty. FRF offers complete workout programs that include eating guides, workouts, calendar, exercise tutorials and coaching. You can check out all of the programs by clicking here. If you have questions on where to start you can also click on the "contact" section of this website and send me a message. You have access to all the information in the world. You just have to take some time and effort and find it. Use the resources around you to start planning a program. Send me a message or checkout the hundreds of posts and workouts here at FRF. 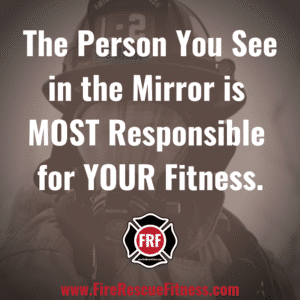 You can also look up the FRF Nation on Facebook where I post often and talk with the thousands of firefighters that are using FRF to get more fit for duty. Excuse #4. I’m way too tired to workout. If you’re too tired to workout, change your sleeping habits, not your workout habits. Sometimes that is difficult with the demands of calls and family, look at your current sleeping habits and find and extra 15 or 30 minutes. Possibly find a time to take a nap. If your feeling sluggish get up and start moving. Objects in motion have a tendency to stay in motion. Believe it or not, working out actually will give you more energy. Excuse #5. I don't have time. (Yes, I know I used this one already). I know I covered this excuse already but it is the single-most common excuse I hear from people so I wanted to give you extra reasons why it is not valid. When people feed me the "I don't have time" line, I like to play the "don't have time game" and have them audit their time. Next, figure out how much time you sleep and work each day. For the purpose of this post, let’s say you work 70 hours a week—that’s 14 hours each day, Monday to Friday. And, you get 8 hours of sleep each night which is 56 weekly hours. Adding 56 and 70 together and you get only 126 hours out of a possible 168. This leaves 42 extra waking hours each week that you don't have time to exercise? That is almost 2 days. So, what are you doing with that 42 hours? Everyone has enough time for health and fitness. Workouts do not have to be hours or even an hour long. You can make great fitness progress with 20-45 minute workouts. Break workouts up into different sections, do 10 minutes of mobility work in the morning, do some bodyweight strength in the afternoon and then some cardio in the evening. This is not the ideal but my point is that you can find time. Remember good health and fitness is a choice. I understand that some days things come up and you really may not have time to train that day. But over the course of a week, you do have the time. What is your excuse now. All of these excuses have one thing in common. They all involve choices. You have to choose to make time. You have to choose to workout (and stay consistent). You have to choose to educate yourself about fitness. You have to choose to get moving. You have to choose to make time (I know I used that one already). The take-away from this entire article is this... No one lacks time. They lack willpower and motivation. You must get your mind right first, make the choice to get healthy and then take action. I hope this helps get you motivated to lose your excuses. If you have any questions or need some additional motivation please feel free to comment and/or send me a message (via the "contact" page). People are counting on us all! When I started reading the article I thought, “Oh, nice encouragement Aaron. Calling us out, you don’t know me!” However, Aaron is encouraging us. Yes, we’re all busy and we have our own unique concerns, but he is telling us we can find the time. Ten minutes is still better then zero. If we have a goal of loosing weight, gaining strength, maintaining endurance, one step is all it takes a day. When my son wants to shoot hoops, but I want to work out, I’ll shoot hoops with him. It may not be the activity I was hoping for, but, it is active.